Kayaks have existed for a very long time. It is thought that these quick, streamlined, boats have been around for about 4,000 years, though they didn’t really become sporting boats until sometime in the mid-19th century. Around that time, French and German men began taking to the waters in their kayaks. In 1931, a fellow by the name of Adolf Anderle became the first person to kayak down the Salzachofen Gorge in Austria — an early adventure in white-water kayaking. Not long after, in 1936, kayak races became a part of the Berlin Olympic Games. 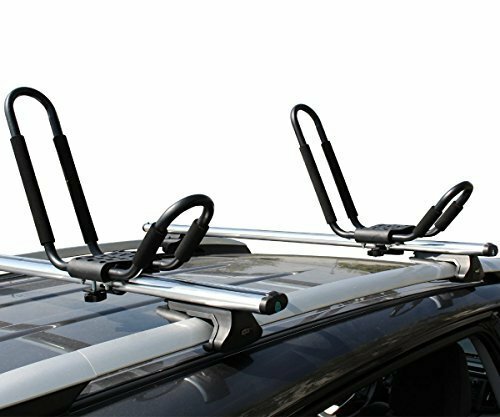 Click Here to See Our List of the Best Kayak Roof Racks. Originally, the watercraft was used by the Aleut and Inuit peoples for hunting and transportation. It was meant to be a practical, efficient workboat. And the work was probably close to home. But these days, a kayak is the starting point for fun. There are an endless variety of types and designs, made from metal, fiberglass, wood, plastic, fabrics, and other materials. Unless you are lucky enough to live near splashing rivers, serene lakes, or other blue portions of the globe, you will need to drive your kayak out to those places where the water waits for you. 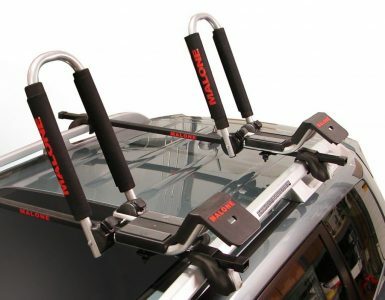 Most people use a kayak roof carrier for their car or truck for this task. They range from a basic inflatable or foam pads to cushion and protect your boat – not to mention the roof of your vehicle – to elaborate saddle and roller systems that grab on to your kayak securely but can also provide some assistance in loading them onto your vehicle. 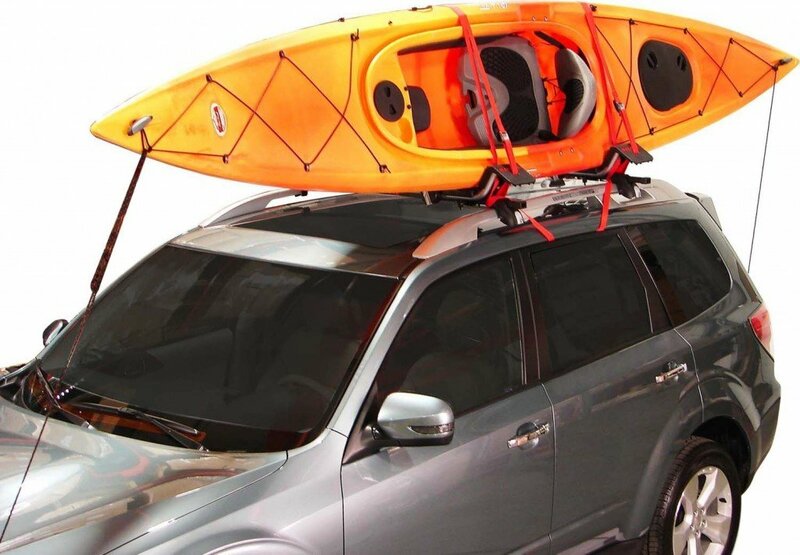 J-style racks are an extremely popular choice for hauling kayaks. They have a simple design consisting of a base and a holding arm, which take the shape of the letter “J.” Some of these racks fold down nearly flush to your crossbars when not in use, eliminating wind noise and drag. This type of rack allows you to load your kayak from the side of your vehicle. The boat itself sits on its side at an angle, leaving lots of room on your roof to carry bikes,skis, cargo boxes, whatever you’ve got. J-style racks are generally very sturdy and will hold your boat quite securely. They are good for larger boat sizes, as well. 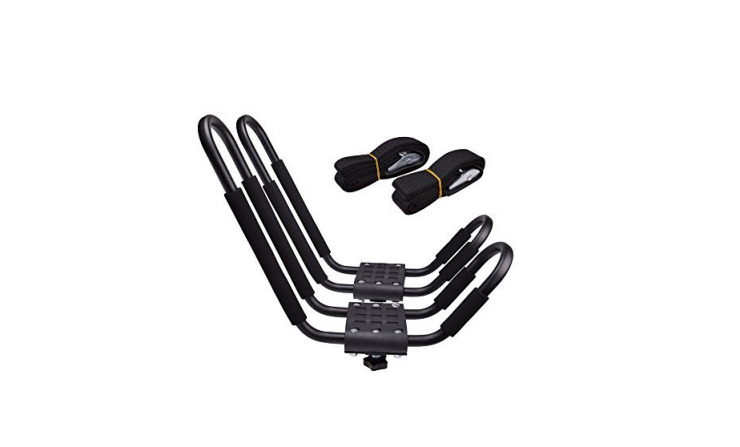 The TMS J-Bar Rack HD Kayak Carrier J-style rack by T-Motorsports is a candidate for the perfect kayak hauler. This rack is an extremely popular model within an extremely popular style of carrier. It has a lot going for it. Durable and easy to install, the rack can hold a wide range of boat sizes, and, perhaps best of all, it is easy on the budget. If you have a large boat, such as an ocean or touring kayak, this TMS rack might be right for you. 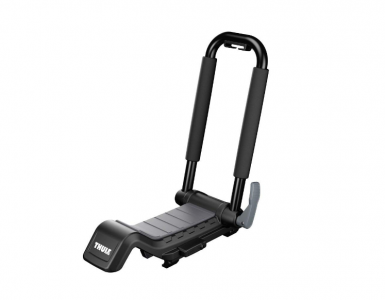 It features tough steel construction, for extra strength. This rack will hold kayaks up to 36 in. wide and 75 lbs. There are adjustable pads on the carrying arms to protect your boats from damage during your trip. According to the manufacturer, this rack is designed to mount onto virtually any type of crossbar on the market. After unboxing, you’ll have to do some assembly work on this rack. All the hardware you need for this is included. There is a stamped wrench included for tightening nuts, but some users have reported that it is less than adequate for its intended purpose. It’s a good idea to have a solid adjustable wrench ready to go. The volume level is a bit low, but it will give you a close look at the rack and assembly process. Once you inspect the parts carefully, however, you should have a clear idea of how they fit together – the assembly process is not that complicated. Even if you are mechanically inclined, it may be a bit tricky attempting to line up the holding arms, the bolts, and the stiff rubber block at the bottom of the carrier. Users have suggested boiling the rubber block to soften it, making it more easily adjustable, and allowing you to slide it onto the two parts of the holding arms with less difficulty. This J-style rack, like most of the others you will see, has universal fitting clamps, letting you attach it to a wide variety of crossbar systems. After attaching it to your crossbars the wide J-shaped rack makes for easy loading of your kayak from the side of your vehicle. Once your kayak is on the rack, it will sit in the J cradle at approximately a 45-degree angle. So, you will have quite a bit of space left on top of your vehicle for snowboards, bicycles, luggage, and more. The TMS carrier comes with two loading straps included, but some users suggest buying additional straps for a more secure tie down. We think the TMS rack is a very solid, reliable kayak carrier. Bells and whistles are not a part of this product. Overall, this rack is a rugged piece of equipment. Its tough steel construction should make it a part of your kayaking experience for many years to come. If you assemble and install it with care, and add some better load straps, you will have a great rack system. A very practical choice. One last thing about the TMS kayak rack: We believe you will be very happy with the price tag.